Apparently the swine flu panic is over in San Miguel. Despite all of the news reports about the flu in Mexico there hasn't been even one case in San Miguel. No one is wearing masks on the streets here except a few people required to wear them by their employers. 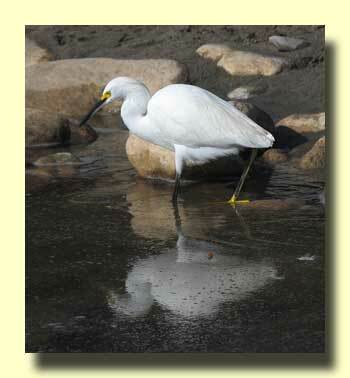 We were have the evening cocktails when one of the couples staying in the park asked our opinion about a good place to stay down on the Michoacan coast. 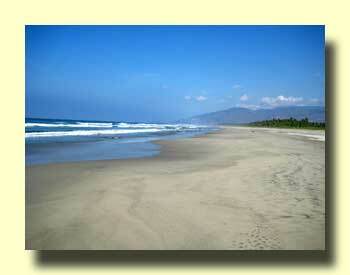 This coast, running from Tecoman to Lazaro Cardenas, is rapidly becoming a popular RV destination. 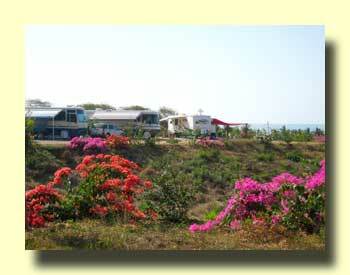 Rancho Buganvilias, the first good RV park along here, has been in operation for several years now and there are some other parks either under construction or in the planning stages. 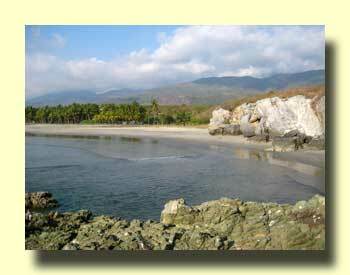 We've included some pictures of Rancho Buganvilias below. Facilites there are excellent, the owners are simpático, the pizzas are the best, and the beach is terrific! Also, they've got good electricity. Update! During the 2009/2010 season this park is closed and should be avoided for safety reasons. See note on the Mexico Updates page. A good sign on the highway makes it easy to find Rancho Buganvilias. 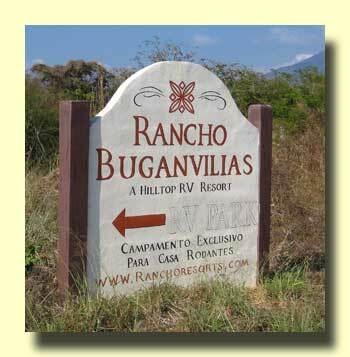 Why would they call it Rancho Buganvilias? This is a beautiful coast.